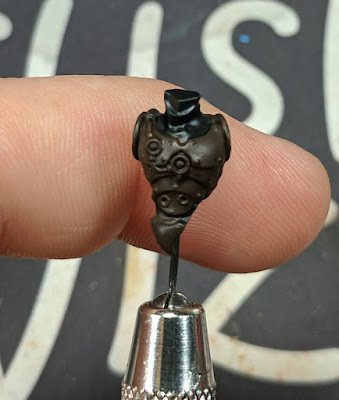 For this tutorial, I'm going to use a spare Adeptus Mechanicus Sicarian torso. The chest plates make excellent an example, and it really shows off High Contrast Metallic well. We will be attempting to glaze with metallic paints. For this they need to be watered down a bit and we will be doing multiple coats, each step. 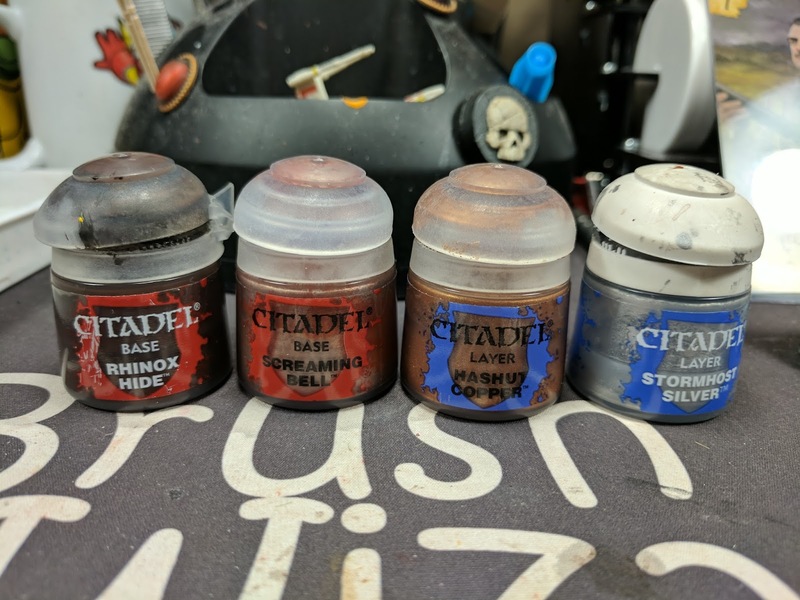 Citadel's metallic paints don't really like being watered down. But for this, we will need to. You'll have to play with it to find just the right consistency. Too wet and it breaks down, too thick and it covers too fast. I do all my painting on a Masterson wet palette. This allows me to mix paint in smaller quantities than when I was using 10 well palettes and it doesn't dry out as fast. 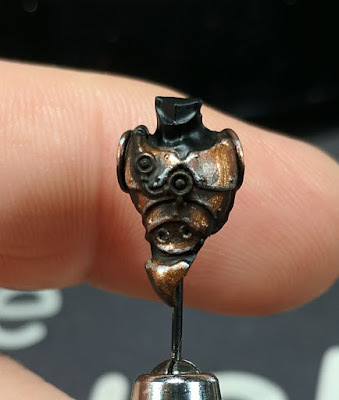 Also the wet palette seems to allow me to thin my metallic paint easier. 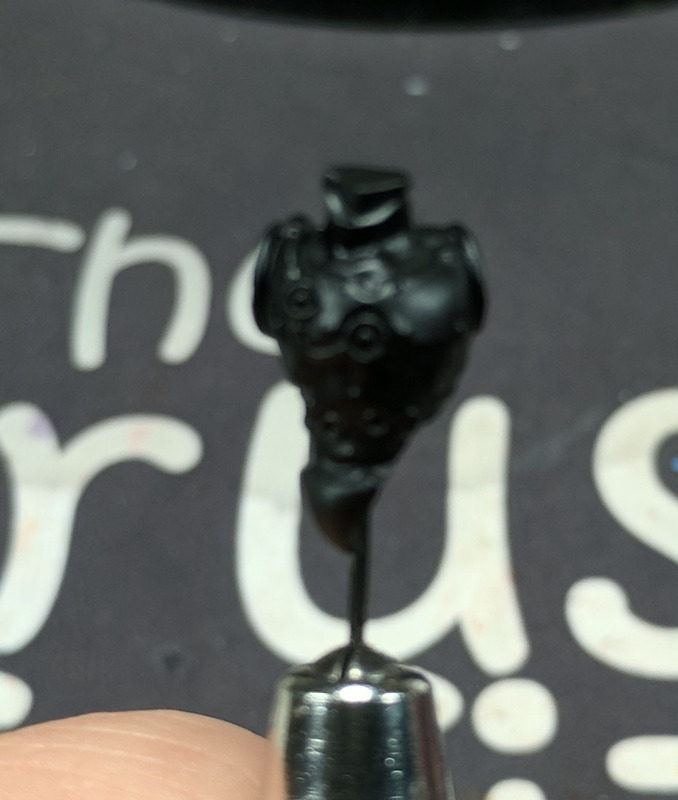 Prime the model with Black. I use Citadel Chaos Black Spray. Obviously, you want to make sure you get even coverage. Please excuse the blur on this, it was really hard to get a picture of and I thought I had gotten it. 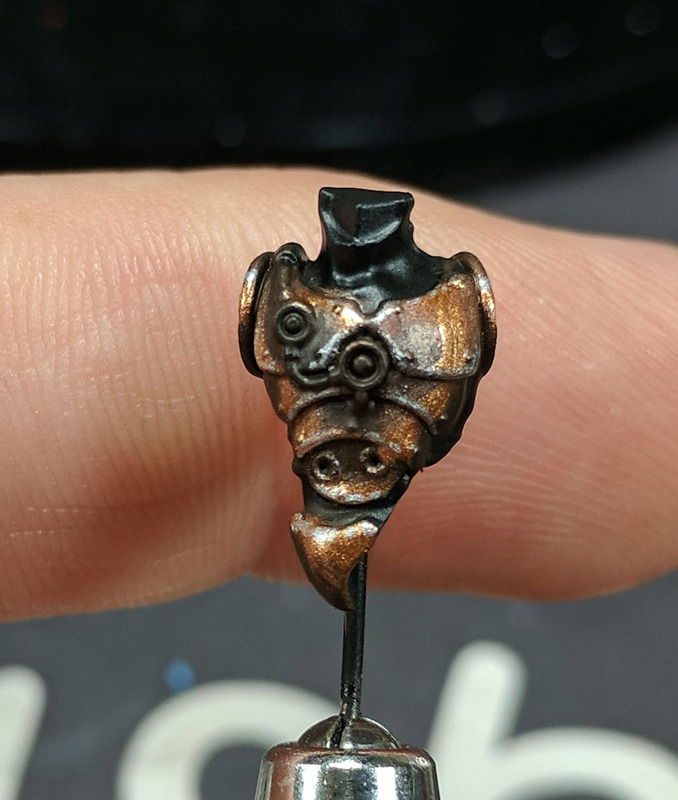 Base coat any areas that are going to be copper with Rhinox Hide. This will eventually become the shadows of the metal, so we want to make sure we have an even coat. Next up we start on the metallics, with a mix of Rhinox Hide and Screaming Bell. We want to find a mix that is about halfway between the two colors, brightness wise. I mix this by eye, and usually keep a pool of Rhinox Hide and Screaming Bell to the side to compare. For this step we want to leave Rhinox Hide showing in the recesses and pay attention to how light would act on the surface. For example, the top of the head will be brighter than the lower section, while the front of the mouth piece will have a line running its length, instead of being shiny on top and dark on the bottom. We want the transition from pure Rhinox Hide to the mix to be a gradual as possible. So if you need to, glaze some Rhinox Hide where the two colors meet, if you have too stark of a jump. Once you're happy with the transition from Rhinox Hide to the mix of Rhinox and Screaming Bell, its time to move on to straight Screaming Bell. The same as before, keep the previous layer showing and make the new layer transition from that to straight Screaming Bell. The area we are covering will be narrower than the previous area. 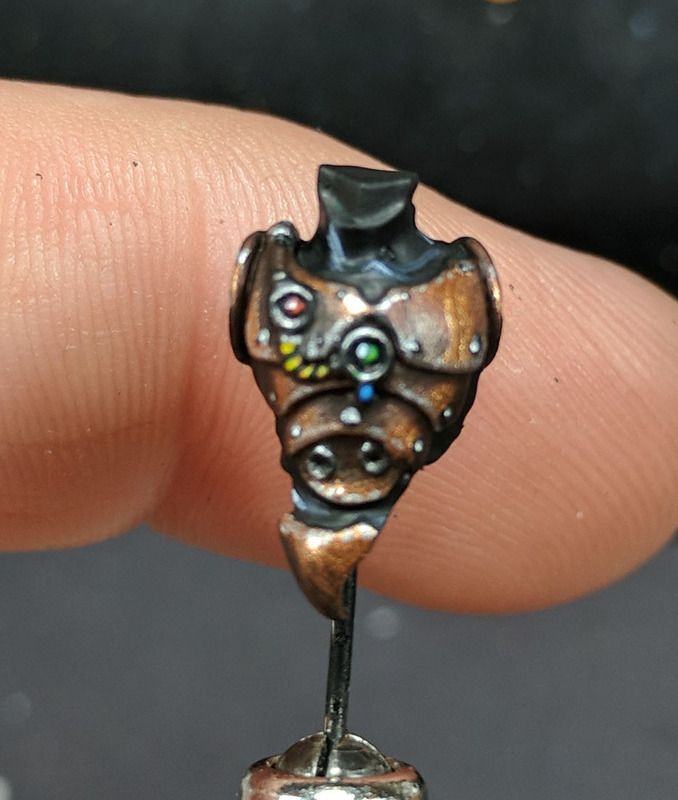 Again, if you're not happy with the transition of color from the previous step, feather the edge with the mix of Rhinox:Screaming Bell to even it out. Now, we are going to do our highest highlight with Hashut Copper. 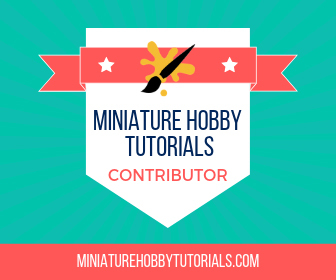 This paint is a little finicky and doesn't like to cover well on its own, so you may end up with multiple coats to get the color to start showing. This time we want the smallest surface area possible, as this is where the light is reflecting the brightest. Also, since this is supposed to be a stark highlight, we don't need to worry about the transition from Screaming Bell to Hashut Copper being too hard of an edge. With all of the copper paint finished, we go though and edge highlight the model with Stormhost Silver. Remember, the light will reflect off of the top and bottom hard edges, due to the light coming from above and then bouncing off of the ground. The final step is to go round and paint all the recesses with Rhinox Hide, to both clean up the edge highlighting and give the metallic areas more definition. 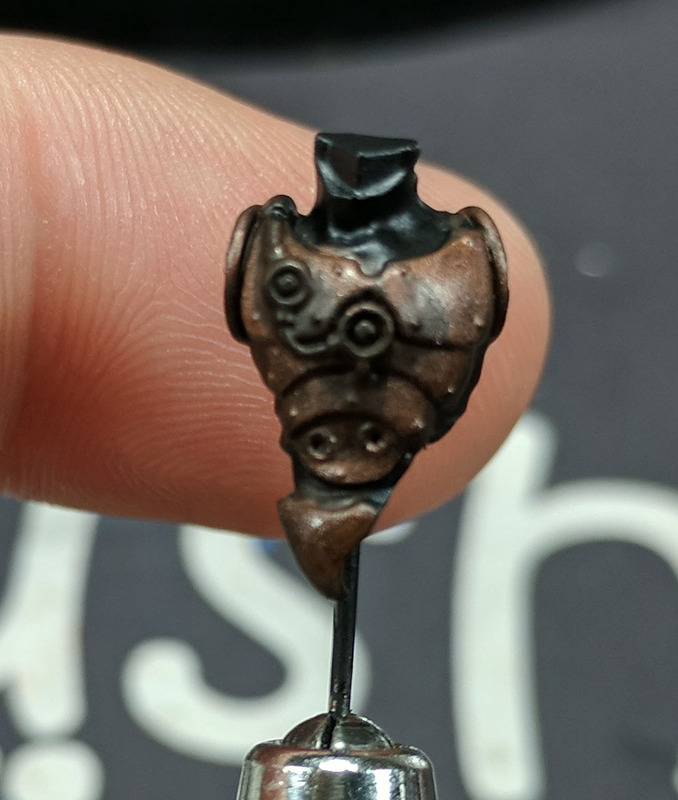 This is a tedious process, but really sells the look of the model when done. And that's it! 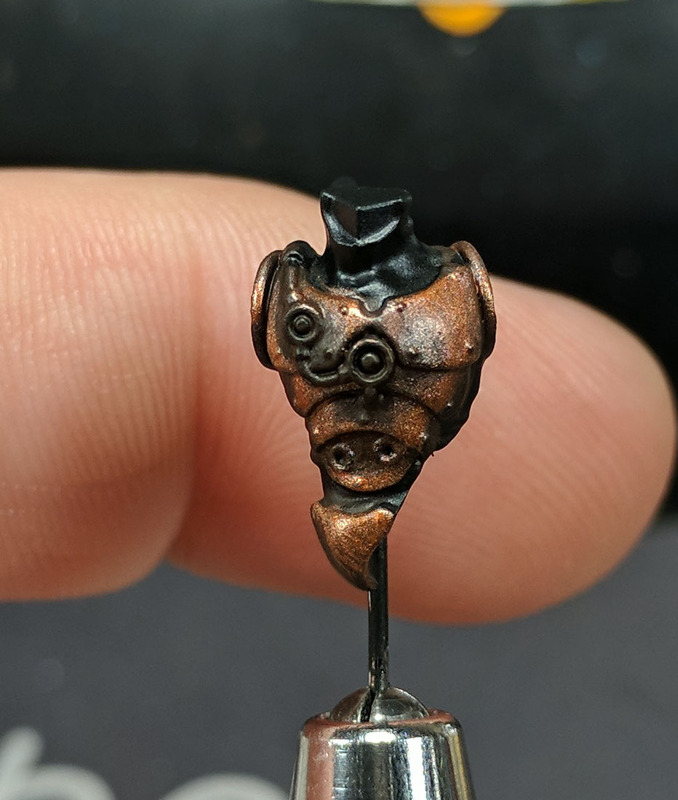 I follow a simplified version of this for doing my Skitarii's copper armor plating, mainly not worrying about how the different layers blend together. And it looks great! From here, you can add weathering and oxidation to your heart's content. 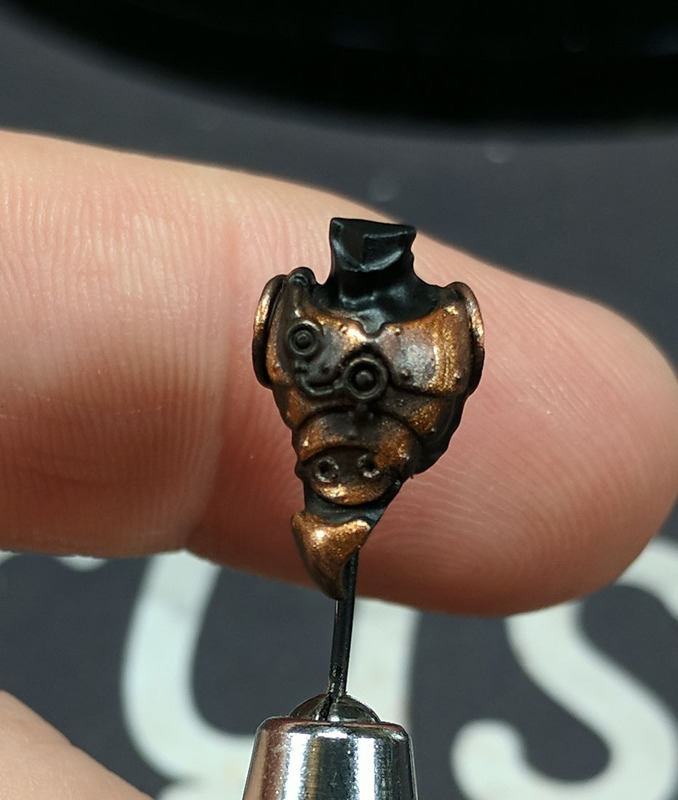 I have a tutorial on weathering brass, which should help if you need it.  Hopefully this helps you with your copper painting!